The Adventures of Tintin: The Secret of the Unicorn, which will be released in North American cinemas on December 21st and in Australian cinemas on December 26th, 2011 has become a box office hit in the UK, France and Belgium. The American performance capture 3D feature film, directed by Steven Spielberg and produced by Peter Jackson is based on the beloved Les Aventures de Tintin comic book series, created by Belgian artist Hergé in 1929. Given The Adventures of Tintin: The Secret of the Unicorn is a American/New Zealand production, it may seem unusual that Paramount Pictures and Sony Pictures International have decided to theatrically release the anticipated feature film in Continental Europe and Eastern Europe some months before America, Asia and Australia. 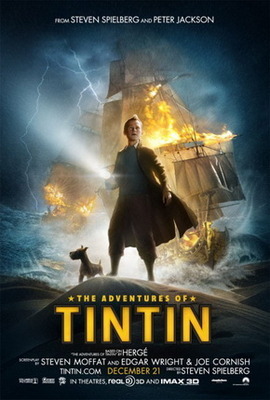 This appears to be a strategic move given that European audiences are more familiar with the classic comic book series, which centers on the timeless characters of Tintin, a young Belgian reporter and his companion Milou, Tintin's best friend Capitaine Archibald Haddock, the absent minded Professeur Tryphon Tournesol and detective twins Dupont et Dupond. This unusual distribution schedule has seemingly paid off, given The Adventures of Tintin: The Secret of the Unicorn has broken box office records in Belgium on opening weekend and topped the French box office and UK and Ireland box office on opening weekend. The growing financial success of The Adventures of Tintin: The Secret of the Unicorn in the foreign markets is also expected to be replicated in North America, Asia and Australia later this year. However there is the question that these audiences may not be familiar with the European comic book characters (which is probably the main reason for the distribution schedule). The Adventures of Tintin: The Secret of the Unicorn is not the first Les Aventures de Tintin feature film adaptation (Tintin et le mystère de la Toison d'or (1961), Tintin et les oranges bleues (1964) are two previous live action feature film adaptations), but it is certainly one of the most expensive and is expected to be the first of a trilogy of feature films to be co-directed by Jackson and Spielberg. (See the remarkably different US trailer below). The feature film adaptation of Les Aventures de Tintin comic book series somewhat mirrors another recent feature film adaptation of a classic European comic book series; Goscinny and Uderzo's Astérix comics. The live action Asterix franchise includes Astérix & Obélix contre César (1999), directed by Claude Zidi, Astérix & Obélix: Mission Cléopâtre (2002), directed by Alain Chabat, Astérix aux Jeux Olympiques (2008), directed by Frédéric Forestier and Thomas Langmann and Astérix et Obélix: Au Service de Sa Majesté (2012), which is currently in production and will be released in 3D in October 2012. The Asterix feature film franchise is incredibly popular in Europe and upon it's theatrical release in 2002, Astérix & Obélix: Mission Cléopâtre was the most expensive French feature film ever made. However despite box office success in Continental Europe and Eastern Europe, the live action Asterix franchise has had little financial success outside Europe. This is most likely due to the Asterix franchise being filmed in the French language, but it also could be attributed to the fact that the Astérix comics, like Les Aventures de Tintin comic book series, remains somewhat little known outside Europe. Spielberg and Jackson seem defiant on bringing Hergé's classic comic books to the masses, by creating not only a 3D blockbuster, but also intent on developing a blockbuster feature film franchise based on the comic book series. The critical reception of The Adventures of Tintin: The Secret of the Unicorn in Europe has largely been positive with praise from Le Figaro Magazine, Empire Magazine and Variety. Whether the financial and critical success of The Adventures of Tintin: The Secret of the Unicorn translates across the pond, remains to be seen. This movie sounds really interesting. I've been quite fond of the books when I was younger, always so entertaining but not it's a movie which is just great. Nice review. The trailer looks and sounds dramatic. I'm sure to watch this. Unicorns yay!